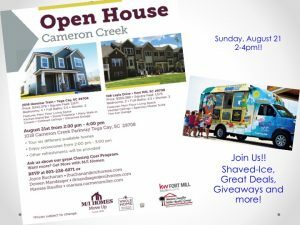 Open House Spectacular at Cameron Creek ~ 1018 Cameron Creek Parkway Tega Cay, SC 29708 ~ Sunday, August 21 ~ 2 – 4 pm ~ Tour 6 different homes. Snow cones. Refreshments. You do NOT want to miss this!